Team Seattle, The Heart of Racing, would like to thank you for your patience in awaiting a decision on our participation in the Rolex 24 Hours of Daytona and the IMSA WeatherTech Series. The past months we have been exploring potential funding for the campaign. However, despite our determined efforts we regret to say that we have been unsuccessful in putting a workable package together. While Team Seattle will not be racing at the Rolex 24 Hours of Daytona, we are still exploring optional fund raising programs for Seattle Children's Hospital Heart Center. Participation in the 2017 Rolex 24 Hours of Daytona would have marked our 20th year racing at this event. 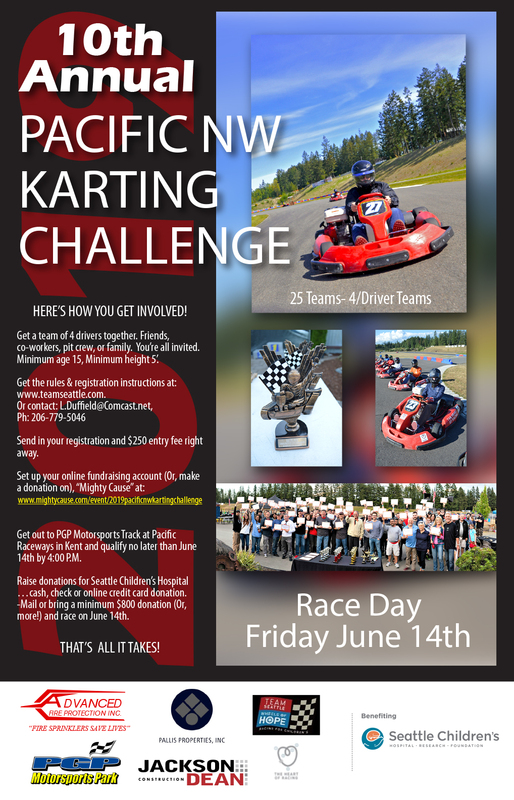 As difficult as it is not to attend, as a team and guild of Seattle Children's Hospital, we can take comfort and pride in the two victories in the race and the near six million dollars our guild has generated for The Heart Center at Seattle Children's Hospital. A most sincere thank you to everyone who has supported this effort over the years. Thank you Gabe Newell for your support this past three years enabling us to take The Team Seattle Guild to the next level—The Heart of Racing. DETROIT, MI. (May 1, 2016) - The Heart of Racing team is at Detroit for the IMSA WeatherTech SportsCar Championship. Quick report from the race. Chased the front end of the car in first session. Power down understeer mid to exit. Got it better by sessions end. Riberas picked up track quickly. New damper set up for second session settled the front down. We were p4 on old rubber. Fastest car on the track on 56 lap tires. Couple tweaks and the through new tires at car and Mario in for simulated qualifying run. P4. Car 95% there. .5 second over the first 13 cars. WTF!!!! Qualifying next. 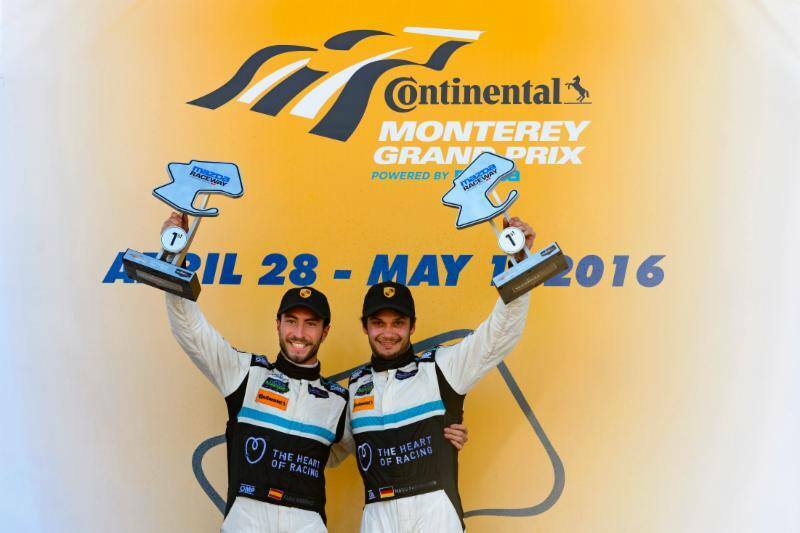 MONTEREY, Calif. (May 1, 2016) - The Heart of Racing Porsche drivers Mario Farnbacher (Germany) and Alex Riberas (Spain) won today's running of the IMSA WeatherTech SportsCar Championship Continental Tire Monterey Grand Prix presented by Mazda run at Mazda Raceway Laguna Seca. Farnbacher and Riberas had a spectacular weekend leading every practice, winning the GTD pole and winning the race by leading every lap. The Alex Job Racing prepared No. 23 Heart of Racing Porsche never missed a beat all weekend. From the drop of the green flag Riberas was able to get the power down and lead into Turn 1. The Spaniard amassed an eight-second lead before the races only caution flew on lap 34. The Cardiac Crew took the opportunity to pit the 23 and put Farnbacher behind the wheel. The German got a good restart and drove to the checkered flag for the team's 71st win in sports car competition. "I jumped in under the full course caution when Alex brought the car in P1," Farnbacher said. "I tried my best to manage the tires. We know the Ferrari is very good over a stint on its tires, so I tried to manage mine as best as I could. It was quite hard to manage my tires with the Ferrari right behind after the restart. It was a great weekend all around. We were fastest every practice and Alex got the pole position. It is very special to win at this track especially to lead every lap from the pole!" Riberas' first time at Laguna Seca resulted in a win. "Absolutely fantastic race," Riberas said. "The first win for the Porsche GT3R in IMSA is very special to me. In the first practice we were P1. In the second practice P1. In the third practice P1. In qualifying P1 and of the race P1. At the start I was able to get a good jump at the green and keep the lead. I opened up an eight-second lead until the yellow. Mario got in and did a good job to manage the car to the win over the Ferrari who was close behind. It was a great team weekend. The Alex Job Racing crew did a great job with the Heart of Racing Porsche. It is great to get a win at a track that you drive for the first time!" "What a day," said Alex Job, team owner. "Alex and Mario did a great job to manage the car at a track that is usually tough on the rear tires of a Porsche race car. The team put a car under them that was fast all weekend and we were able to get the first win for this new Porsche in IMSA. A great effort by everyone this weekend." The IMSA WeatherTech SportsCar Championship will travel to Detroit for the Chevrolet SportsCar Classic to run June 3-4, 2016. News courtesy of Alex Job Racing.